No excuses for drinking on an empty stomach anymore. OH TOAST. The buoy of so many tasty things. Jam, peanut butter, Nutella, Marmite (if you’re a weirdo). Well, you can now add beer to that list. If Italy weren’t satisfied enough by giving the world pizza and panettone–they’re now gifting us with spreadable beer. 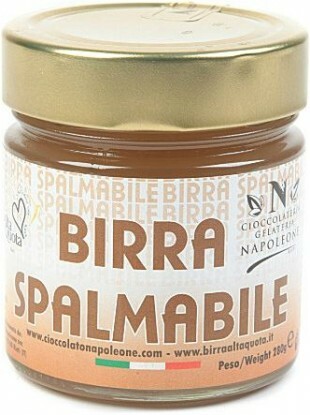 According to Italy Magazine, Birra Spalmabile is the product of two companies, Alta Quota brewery and Napoleone chocolatier. Chocolate maker Pietro Napoleone describes his creation as a “sweet, beer scented jelly” and the creators claim that the spread is perfect on toast, in cakes, or as an accompaniment to cheese and appetisers. There are two versions of the jelly available–one light and one slightly more potent in taste and smell. Each variation comes from using Omid dark ale or Greta blond ale, but both contain 40% beer. We created a cream made of beer by balancing every ingredient we used and also by knowing the reactions are made by mixing these ingredients. So we’ve created a product which is very smooth and creamy, resulting, as the name itself suggests, in a spreadable beer because it can be spread just like a chocolate cream. But where can you get this jelly of the Gods? UK department store Selfridges seem to be selling both variations for £7.99 (€9.45 to you and me). has a strange and most pleasant, slightly sticky, Vaseline-smoothness. I like the taste – a true, if too subtle, beer flavour… At least initially, until a pronounced lingering bitterness puckers my palate. I just wanted something more. It’s a clever concept that’s oh-so-almost there. Email “At long last, you can now spread your beer on toast”. Feedback on “At long last, you can now spread your beer on toast”.